Light Me Up Before You Go Go! The 12th Annual O'Donnell Square Lamp Post Lighting Ceremony & Party scores another high five from the community. The CCA thanks all the participants, volunteers and neighbors who braved the rain and joined in the fun this past December. Congratulations to the Lamp Post Contest Winners! 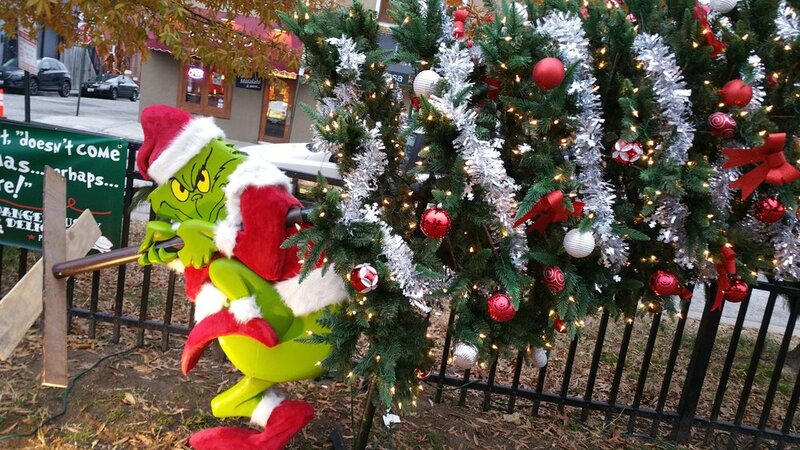 We want to give a big shout out to all the other businesses that decorated a Lamp Post including Southern Provisions, Keller Williams Legacy Metropolitan, Claddagh Pub, Looney’s Pub, Mama's On The Half Shell, El Bufalo Tequila Bar & Kitchen, and Church on the Square. It’s awesome to see the enthusiasm and we loved all the entries! Special thanks to CCA VP Amanda Bourgeois, Pat Weaver from Canton Management Company, and Matthew Bull Lasinski from Southern Provisions for planning and co-hosting the event. Thank you to Jim Hamilton for letting us make a last minute location change to COTS (Church on the Square) and to Santa and Mrs. Claus for making the trip from the North Pole for all the little ones. We also want to show some love for the newly formed CCA Arts Committee who had a great time creating a lamp post design for the Canton Community Association’s entry. The committee chair, Ania M. Milo of Ania M. Milo Fine Art & Pet Portraits, built and painted the awesome caricatures of The Grinch and Max the dog. Julie M. Kichline of [kik-line] DESIGN created the concept, assembled the presents and decorated the tree. Local carpenter and volunteer extraordinaire Chris Broughton made the signs and was a huge help installing the design. The CCA Arts Committee is an all-volunteer group whose goal is to enrich our community via discovering, supporting and promoting local artists. To join, email Cantonarts@cantoncommunity.org. To volunteer for future events email volunteer@cantoncommunity.org.